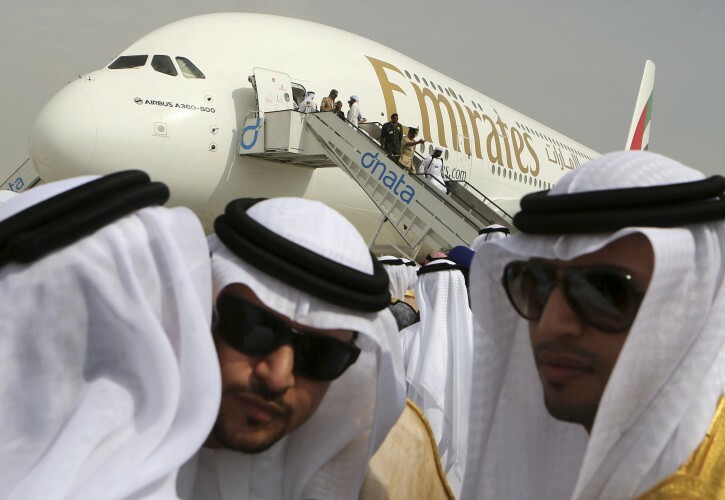 Dubai - The Middle East’s largest airline, Emirates, announced Thursday it struck a deal with Airbus to purchase 20 A380 aircraft with the option to buy 16 more in a deal worth $16 billion, throwing a lifeline to the European-made double-decker jumbo jets. Al Maktoum and Leahy made the comments in a statement after the deal was signed in Dubai on Thursday morning. Leahy had warned only three days earlier that if the company couldn’t work out a deal with Emirates, it would have to shut down the superjumbo’s production line. Airbus has spent years and billions developing the double-decker jumbo jet, even as skeptics questioned whether it could generate enough demand to justify its cost and the bigger runways it requires. Airbus tweeted news of the deal, saying it was “glad to announce” Emirates’ commitment to the A380. At Dubai’s biennial Air Show in November, Airbus suffered an embarrassment when it was scheduled to announce it had a struck a deal with Emirates for its A380, only to see Boeing sit on the podium with the airline and sign a $15.1 billion deal. Emirates’ fleet relies solely on the Airbus 380 and the Boeing 777 for its flights. So - 20 planes, list price, should be under 10 billion. What is that other 6 billion for? An option merely gives the right to buy at a specific price.